This was a birthday card sent to me back in February from my friend from Minnesota, Bonnie. Isn't it cute? I like how she used the pendants across the patterned balloon and then popped up the yellow balloon on dimensionals and stamped the "happy birthday" across it. She used the Celebrate today stamp set and coordinating Balloon Framelits set that are in the Occasions catalog. You buy them as a bundle and save 15%! Be sure to use item#138869 if you purchase as a bundle. The bundle is $36.25. You can order this on my website here. If you don't have a copy of the Occasions catalog you can click on the link on the sidebar of my blog to view it in it's entirety. It's an excellent catalog! We have made it through another birthday season for my immediate family. We have 4 birthdays in February and March. I have lots of birthday cards for others to send out though. This would be an excellent set to crank some out. Maybe I should take my own advice and go order it! April is whizzing by! My husband has been working hard on our pool to get ready for the season. Here in Texas we have trees that hang over our pool that are dropping all of this yellow pollen stuff in our pool. It's a bear to clean out of the pool and the drain. I'm hoping that tapers off soon because my son wants to have a pool party in two weeks and I'm having a visitor coming from Minnesota. It's been typically warm enough. Lots of sunny 80 degree days here right now. I went to my friend, Melanie's, stamp class in February. First I drove to her house by mistake and then I drove over to the place where it was really being held. I arrived late but made most of the cards still. This one I took the pieces home and arranged them differently. I love how the butterfly looks cut out in designer paper. The die does all of the work on this card. The butterfly is really the focal point. Colors are Crumb Cake for the base, Lost Lagoon for the embossed panel, and Very Vanilla and Strawberry Slush for the greeting. My daughter is visiting us here in Texas this week for her Spring Break. Unfortunately it is supposed to be raining or cloudy all week. She and I are going to Corpus Christie today until tomorrow. It won't be great beach weather but we are going to make the most of it. It turns out temperatures won't be much warmer in Texas than they are in Minnesota this week. I was hoping to have some nice sunny weather for her. Of course we will have that next week once she flies back to Minnesota! This set is called Sheltering Tree. So many possibilities with this set. I haven't scratched the surface with it yet. I wanted to try it out first in pink. I teamed it with the Valentine paper, Stacked with Love. We had a visit from some friends from Minnesota Sunday night. It was so good to see some familiar faces in our home! Paula and her husband, Don, have been traveling all over the US throughout February. They stopped in for an overnight visit on their way to Arizona. Here is a picture of Paula and I before they took off the next morning. We didn't have warm weather for them when they came. It was in the 30's when they left. Hopefully, they will have warmer weather in Phoenix. Isnt' it fun? It's gone to a new home now. The Goodwill Outlet was an experience. I had read about how crazy it can get there. I was too intimidated to try it on my own for the first time. So my husband was a trooper and went along. I knew he would do most anything I wanted on my birthday. At the Outlet they had these huge blue bins on wheels that you literally dig through and find things. There are bins of clothes, bins of books, and bins of random stuff. We couldn't figure out why people were lining up in certain areas. It turns out that every so often they wheel out new blue bins of stuff. When they give the go ahead the people in line run to the bins and grab everything they can. There was a guy that grabbed an armful of shoes. I think he went to the side and looked through them and decided which ones to keep and which ones to put back. We didn't take part in that craziness. We were content to dig through their leftovers. When you are done you bring your stuff up to be weighed and you pay by the pound. I'm planning on cleaning up the stuff I bought and selling them on ebay. That's my new business. I'm having lots of fun with it! There is a ton to learn about what sells and what doesn't but that is all part of the fun. It is 50 mini cupcakes. It was packed in thermal packaging and an ice pack. They came from a bakery in New Jersey. They were yummy! Hey there, hi there, ho there! Long time,eh? I've been busy. It's amazing how busy your life gets when you aren't actually working a traditional job outside of the home. You fill up your time. At least I do. I have never been one of those people who get bored being at home. I have lots of stuff I love to do! Right now my mother-in-law is here in Round Rock for a visit. She's not one of THOSE mother-in-laws. She's a sweetheart! Very positive, optimistic, sweet and easy going. I'm lucky, right?! We ran errands today and had lunch. Tomorrow we may get our nails done and run some more errands. Did I mention it's beautiful 70's and sunny here right now? Yeah, I'm rubbing it in to my Northern family and friends. Come see us, K? Well, one of the things I love to do is stamp, of course! That has been suffering as of late and I'm here to remedy that. Often times when I am not stamping several days a week the creative juices don't flow. It's like exercising. If you don't use those muscles on a regular basis you lose them. Get it? Use it or lose it! Use those stamping muscles ladies(and gents!) You'll feel better for it. Promise. Do you want to see the card I made with it? Course you do! I had this idea to make a Monarch butterfly out of the medium sized butterfly. I have been a little out of touch with the stamping world in the past couple of weeks so maybe this has already been done to the point of nausea. I'm not quite sure. Or maybe I'm brilliant and you are jumping right out of your chair right now. Careful, don't hurt yourself. Here's what I did. I die cut the butterfly out of black cardstock. Here's a tip for you: Use a layer of wax paper between the die and your cardstock. Your cardstock will lift off easier and you will have a beautiful wax paper butterfly that you may just have to use on your next project. Once the butterfly is diecut, trace around it with a pencil on some Monarch butterfly colored cardstock. LIke Tangerine Tango. That's what I used(and I highly recommend it!). Once your butterfly is traced onto Tangerine Tango(cuz you know you're going to use that color now), cut out with your paper snips just inside the pencil lines. Do you need a visual? Yeah, I thought so. Here ya go! Next poke out all of the innards so the beautiful butterfly detail shows through. It should be easy to poke out. If not, there are some things you can do. Like shim your sandwich with some cardstock when running it through your Big Shot. If you are having problems with it just shoot me an e-mail and I'll do my best to help. Next you need to add some adhesive to the black butterfly. I used Tombow multipurpose liquid glue, item#110755, $3.95. Use it very sparingly so it doesn't glob out. Actually the Transfer Adhesive Sheets, item#133722, $6.95 would work much better. But I didn't have any. You can adhere to your black cardstock before you die cut so that when it's die cut just peel off the sticker back and it will be easy peasy to attach it the tangerine tango cardstock. Note to self, "On your next order put some Transfer Adhesive sheets in your cart. Here is a visual of the amount of tombow multipurpose liquid glue to use. When you're done your Monarch butterfly will look like this. I wasn't planning on doing a full on tutorial but you deserve it. Really you do. You have been patiently waiting for me to post something new on my blog, am I right? 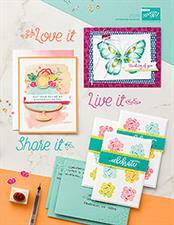 Yep, everything can be ordered through my online ordering website here: http://myhappystampingplace.stampinup.net. Hi folks! Long time no talk. I've been busy. I'm sure you are too, especially at this time of year. I ordered some product from the upcoming Occasions catalog and Sale-a-bration catalog. They both come out January 6. Demonstrators get a sneak peek and can order things a month early. It is an early Christmas present for sure! 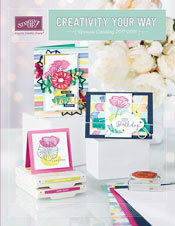 The new Occasions catalog coming out is one of the best catalogs ever! I mean it! I am sooooo excited about the products in it! This set is probably my fave. It's called Wood You Be Mine. Until about 6 months ago I lived in Minnesota. Born and bred. Minnesota is Paul Bunyan country. For those of you unfamiliar with Paul Bunyan he is a character in American Folklore. He is a lumberjack and his cohort is Babe the Big Blue Ox. There are many statues and stories of Paul Bunyan in Northern Minnesota as there is in other states in the US. If you want to learn more about Paul Bunyan here is a link to Wikipedia about him. All this to say that this stamp set makes me nostalgic for Minnesota. I couldn't wait to dig into this set! Here is my first card with it. It comes in Photopolymer only. I'm still on a learning curve with this stamp type but it's growing on me. I've got other ideas brewing for this set. Stay tuned for more!